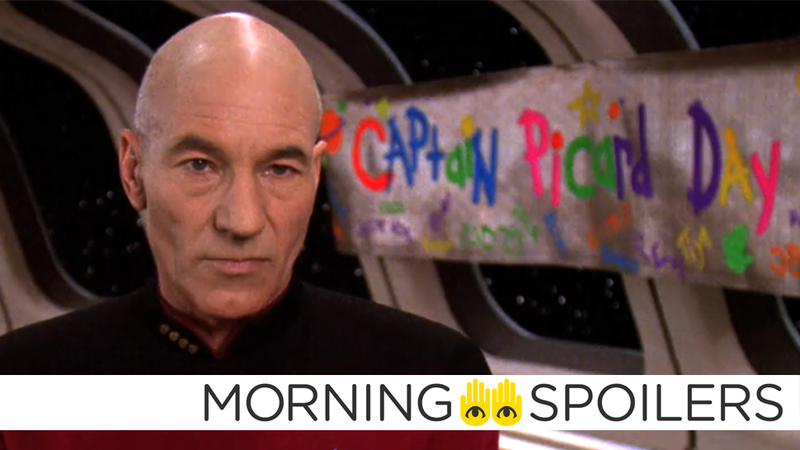 Every day with news about the new Picard show is Captain Picard Day in our hearts. Michael Peña has joined the cast of the Fantasy Island adaptation. James Gunn’s next project has allegedly been delayed. Rebecca Romijn gives us a better look yet at her Star Trek: Discovery character. Plus, a new look at Flash’s next big villain, and what’s in store for Black Lightning and Arrow. Spoilers, away! THR reports Ant-Man actor Michael Peña will take over the role of Ricardo Montalban’s Mr. Roarke in the film adaptation of Fantasy Island. A new rumor from That Hashtag Show suggests English actor Jack O’Connell is currently up for a “lead role” in Matt Reeve’s The Batman. According to Entertainment Weekly, Obssa Ahmed (The Expanse) is playing Victor Pascow, the undead college student haunting Dr. Louis Creed. The Wrap reports Sony has pushed back James Gunn’s “secret” horror film BrightBurn from November 30 to May 24, 2019. The Possession of Hannah Grace will fill its previously announced November slot. The Beast takes shape on a crunchy new motion poster released to tease a new trailer. Hiccup learns he’s destined to bridge a dragon/human alliance in a new clip from New York Comic Con. Astronaut Robert Pattison tries to keep his crew from going insane in a brief new teaser for Claire Denis’ upcoming sci-fi drama, High Life. In a recent interview with Comic Book, Peter Jackson indicated he has no involvement with Amazon’s upcoming TV series. I’m kind of looking forward to it. I was a guy who didn’t get to see the Lord of the Rings like everybody else because I had to make it, so I’m looking forward to seeing somebody else’s take on the Tolkien world. Executive producer Heather Kadin confirmed to Trek Movie that “multiple seasons” are being planned for the new Picard-focused Star Trek series, and it’s not just a one-off return for Jean-Luc. During a panel at New York Comic Con, executive producer Paul Simms teased a story arc in which the cast meet the “cooler” vampires of Manhattan. They sort of think that Staten Island is all of New York or maybe even all of America, but there’s a whole story where they go into Manhattan for the first time to meet the Manhattan vampires, who are a little bit cooler than they are. Rebecca Romijn gave us our another look at her portrayal of Majel Barrett’s Number One on Instagram. Aliens land in Arcadia in the trailer for Guillermo del Toro’s latest animated series, 3Below. The students at Salvatore Academy are lightning their ex’s on fire in a new promo for Legacies. Comic Book Movie has our first official photo of Chris Klein as Cicada. The CW has released a short trailer for next Monday’s animated Constantine special, which promises an additional sneak peek at the new season of Legends of Tomorrow. The CW has also released a long overdue trailer for the second season of Black Lightning. Meanwhile, China Anne McClain took a few minutes to discuss Jennifer’s relationships with Anissa and Khalil in a new interview with KSiteTV. Finally, Team Arrow contends with the Longbow Hunters while Oliver is busy defending himself from his fellow inmates in the latest trailer for season seven.